Thanks everyone for weighing in on some of our ideas for our boy's den switch-up. Our youngest calls the new space his Bat Cave... but I am not quite sure that is what we are going for. So for now, it's the boy's den until we can think of something a bit more clever. I don't typically share an unfinished project, so consider this more of a room progress post but without shots of the whole room (ha, believe me, it's nothing but mess at this point!). We still have to finish the board and batten wall treatment, so the space and I are not at the styling stage of our relationship just yet. 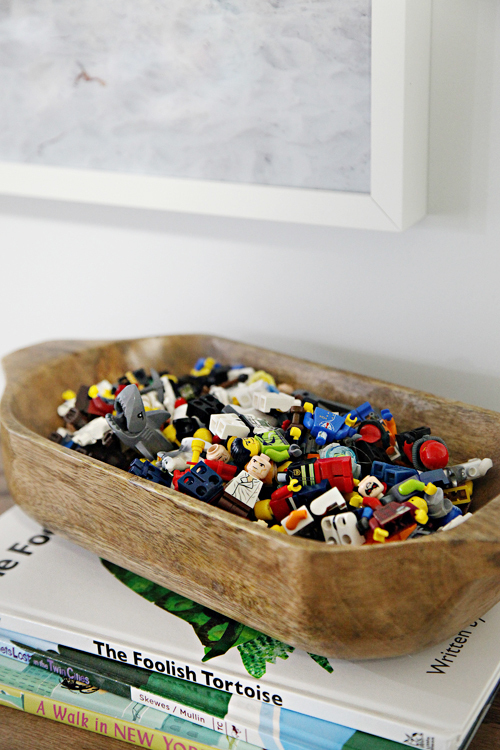 I was just too excited to show you how we concealed the boy's Lego system in a simple and upgraded way. This mini-update was nothing revolutionary or inventive. We literally just upgraded two stock cabinets and tucked our previous storage right inside. Add a wood topper and bam! 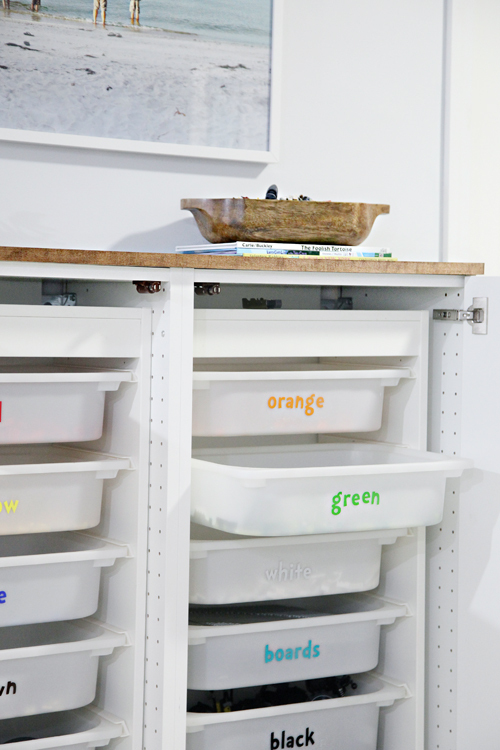 A sleek new cabinet on the outside, Lego storage mania on the inside. 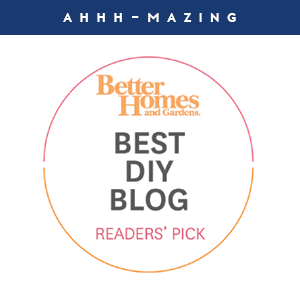 The overall goal of this project was to take our sweet and darling system from the little guy's playroom and give it a grown up feeling for their new and improved boy den. The system itself has worked great for us over the past few years, so the goal wasn't to change something that wasn't broken, but just tuck away the visual clutter. 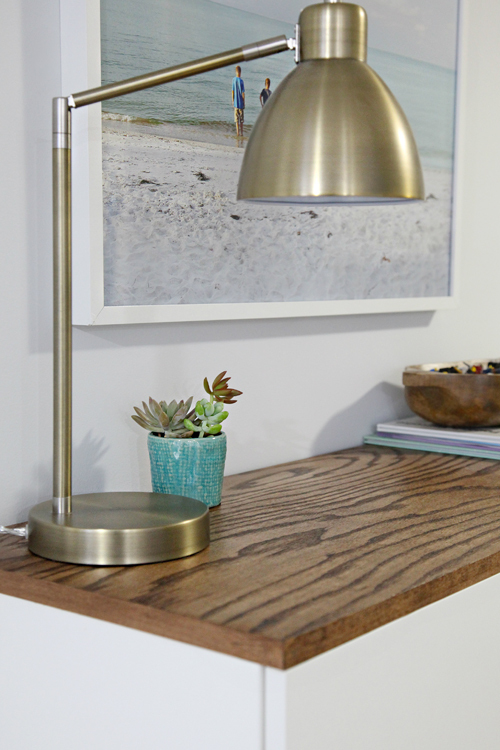 We began by measuring our existing two IKEA TROFAST pieces and determining the placement in their new space. From there, I asked my husband to build a custom cabinet around the unit. I also told him he may be building a custom pantry in the back of the room... Quick Tip: Never ask your husband to do two separate projects in one sentence. After he voted that I try to find a cabinet instead, I decided to check out IKEA's different cabinet systems to find something close in size. I landed on two of these frames and doors, which would allow the TROFAST to fit right inside. 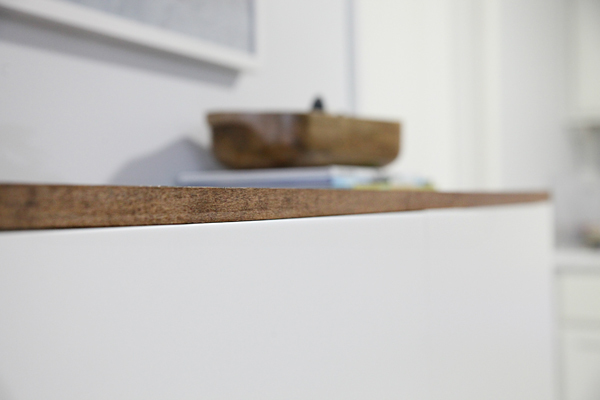 Another Quick Tip: Be sure to account for hinges when considering and measuring IKEA cabinets. 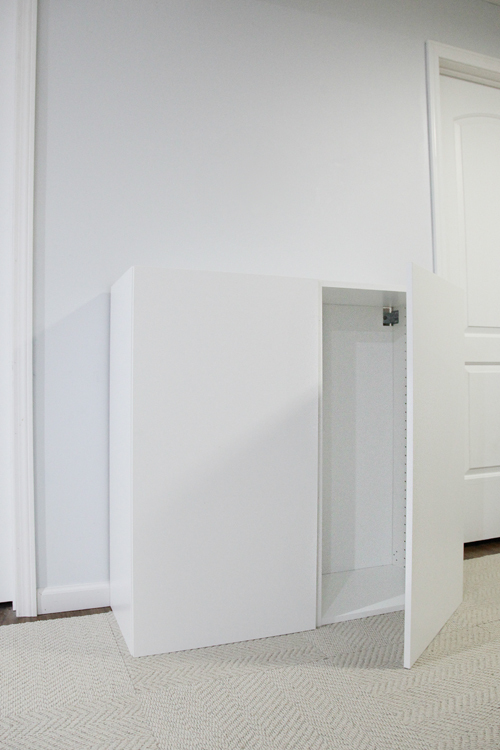 The unit was going to be much sturdier having the two cabinets joined together as one. 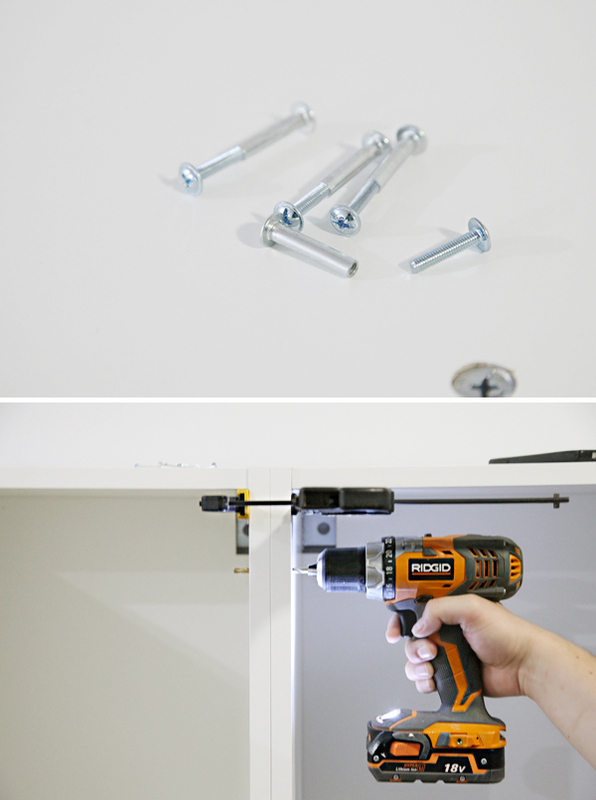 IKEA has special screws for this, making it easy to secure the two cabinets together in four locations inside. 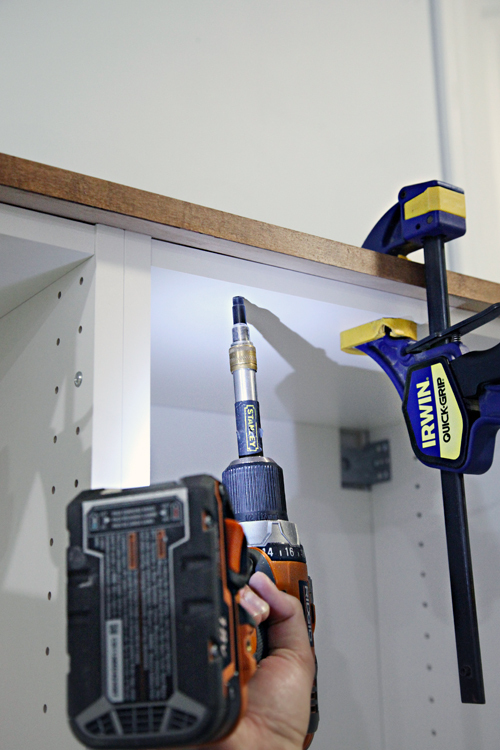 Our favorite grip clamps worked like a charm to hold the two cabinets together while drilling through both sets of cabinets to add the joining hardware. I originally purchased some smaller legs and leg plates from the home improvement store, but when I got them home and near the new cabinet, I realized the scale was much too small. Lucky for me, I had some old BESTA legs on hand, and they already matched color and were scaled much more appropriately. I continued to use the top plate and pieced a screw and bolt from our hardware store together to affix the IKEA legs. 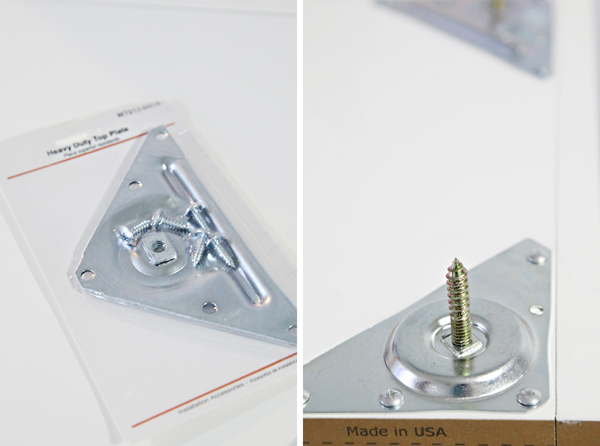 Quick Tip: Take your hardware/project with you to the home improvement store to find the perfect screw and bolt pairings from their mix and match section. We have always found employees to help us quickly search those endless bins for just what we need. This of course is optional, but I like the wood element it added to the piece. We have topped a few other white bookcases and cabinets around our home in the past, and it always adds a nice extra touch. Typically I have worked with pine or poplar boards, but this time I decided I wanted a little grain and picked up a 2'x4' piece of oak. 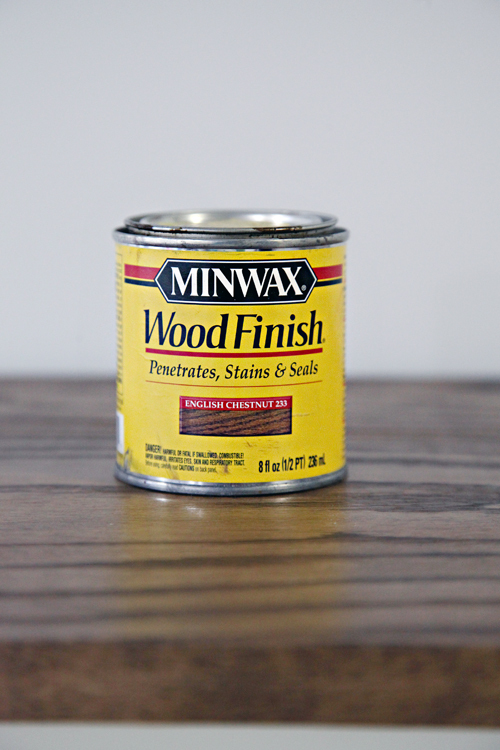 After testing every can in my stash, I not only realized that I prefer staining oak any day to other types of wood, but I also realized that Minwax English Chestnut was the wood stain of choice for this piece. 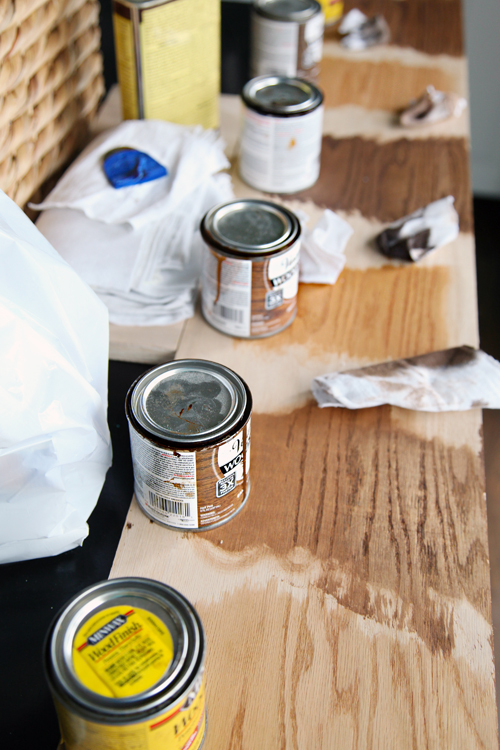 Prior to staining, it is important to sand down the wood and clean it with a slightly damp cloth. I then used a staining rag to apply a coat of stain and then brushed on a coat of Triple Thick poly for a protective finish. Because the edges of the oak board were exposed after being cut to size, I also used some stainable iron-on banding to give everything a nice and finished look. To attach the topper we just pre-drilled and affixed the top with a few small screws, again using our clamps. And that was it! The cabinet is such a nice and clean piece, that can be attached to the wall for stability, yet easily moved if necessary. Best of all, it achieves our goals of hiding the colorful pieces that all of the boys still love to play with. 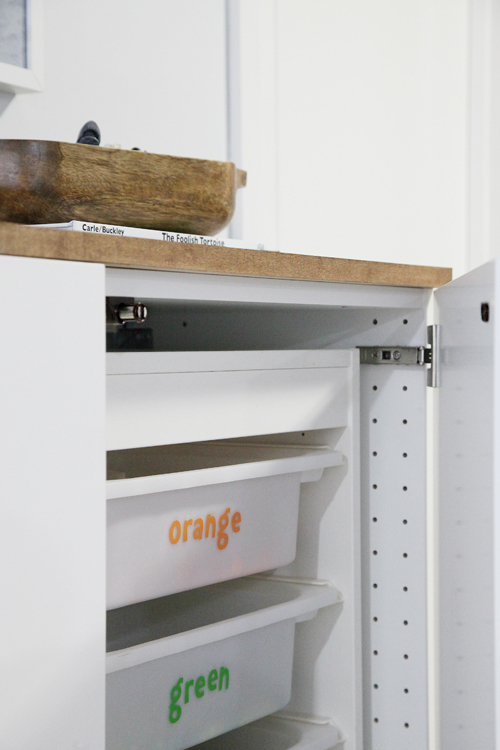 We initially added soft-close dampers to the hinges, however, I couldn't decide on the hardware just yet (waiting until the cabinets in the back of the room are finished prior to deciding on this cabinet), so we added some push-and-pop-open hardware to the inside of the piece for now. It allows the kids to just push in the door and it pops open. Above you can see the magnetic, spring loaded hardware above the Lego organizer and also on the cabinet door. And this little spring loaded latch can be easily removed once we land on hardware for the cabinet doors. Earlier I mentioned we are not quite to the staging point of the room yet. 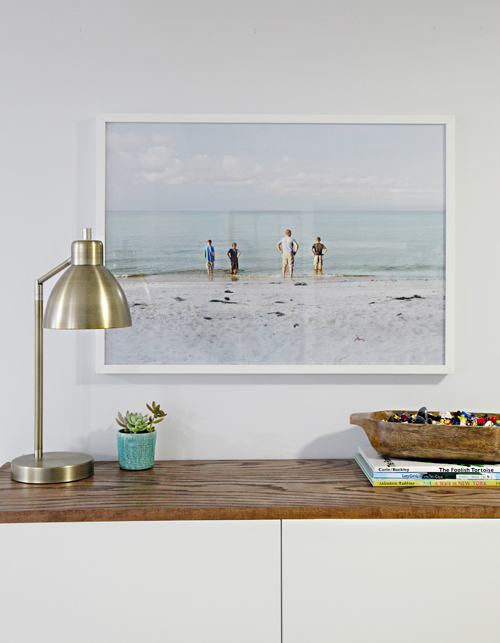 One thing I thought would be nice to add is a photo above the cabinet, so I selected one of the boy's with their dad at one of our favorite beaches. The lamp was borrowed from another room, as was the wooden dish that is holding all of the Lego characters. Eventually I will be doing something similar with permanent accessories for the space, at least with all of those friendly little Lego faces. So although the top will eventually receive a bit more attention in terms of what will live there, I couldn't be more thrilled with how the color and finish turned out. And finally, I receive questions from time to time about how the Lego system is maintaining. For the most part, yes! My boys tend to create builds from their imaginations more than by step-by-step set instructions, so we haven't had too many issues. Over time, we do find that they just acquire more and more random builds, and it may take a family movie session to re-sort some of the colors back down. Otherwise, even when the boys do pull out a manual, they are easily able to find pieces by going to the correct bin. The labels were originally created with my Silhouette craft tool. So the playroom to boy's den transformation has begun. Sometimes it just takes that first project to get the ball rolling. We are hoping to find a weekend real soon to get after the paneling and painting and door moving... only about twenty days left before the boys are done with the school year. 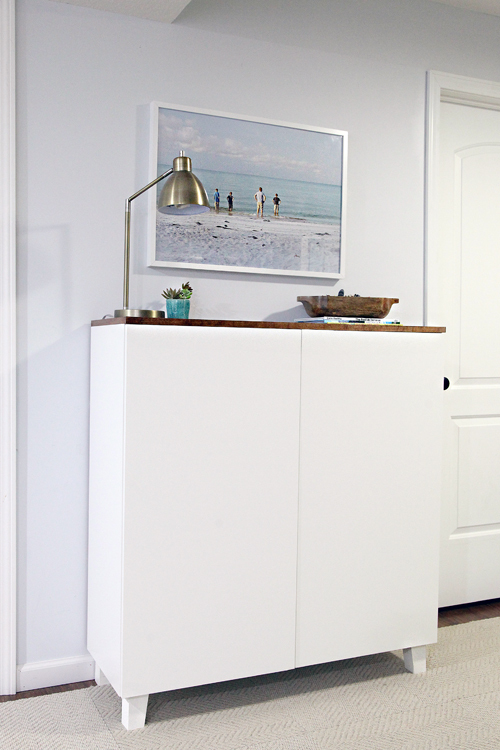 This space update is also going to go hand-in-hand with a few laundry room upgrades and also an office refresh (whoop whoop! ), more details on those spaces soon! 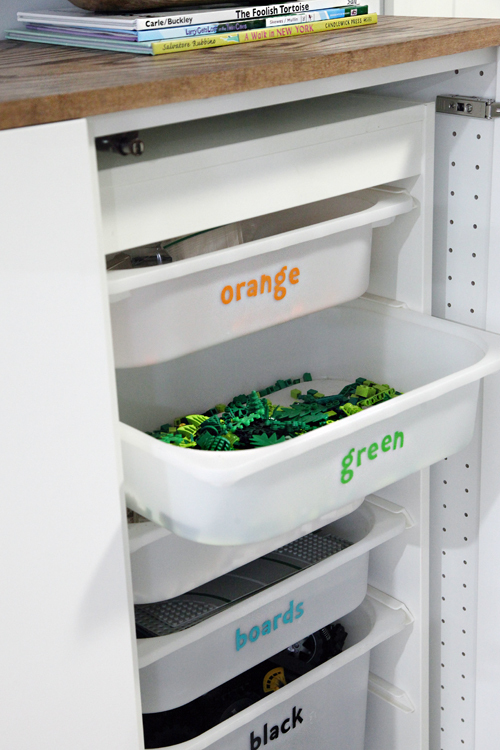 I absolutely love this lego storage idea! I have four boys with probably thousands of legos and I find them all over the place despite all our storage bins. Time to invest in such a storage cabinet. Brilliant! Thank you! Looks so snazzy! 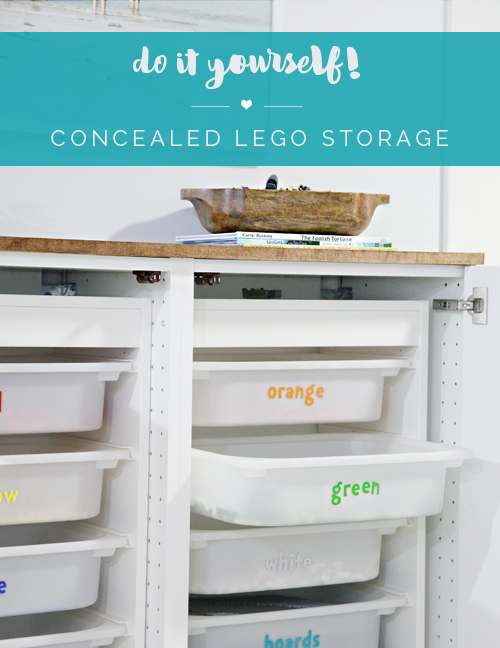 Perfect way to hide the Lego storage. 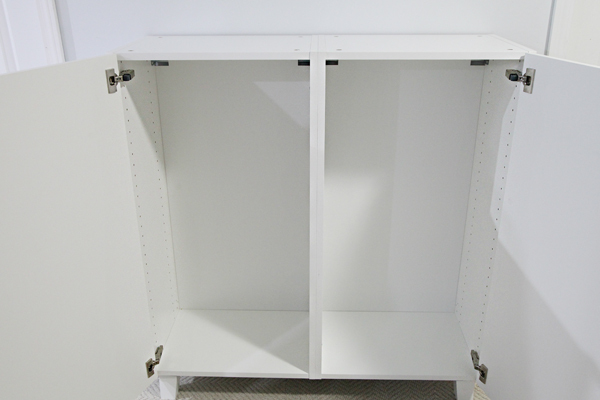 And perfect timing for me since I was wondering where to get 15" deep cabinets for a couple of projects of my own. Looks great- and nice that they are concealed and dust free. How do you store the built creations that the boys want to keep? My guys don't like to take them apart, and want to be able to add to them, but our shelves are overflowing. 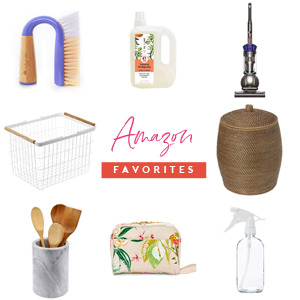 If the chairs don't work out, I recently found out that Amazon carries many styles of unstained chairs at pretty decent prices (about $150 for a pair!). just search the brand International Concepts. So far the room looks great, and I know it must feel good to have one small area done! I know I feel the same way with my living room, it just so happens I knew exactly what I wanted to do in two areas of the same wall. It looks great if i face that wall. just dont turn around lol. Is it bad that I kind of want to get legos just so I can organize them by color? lol. 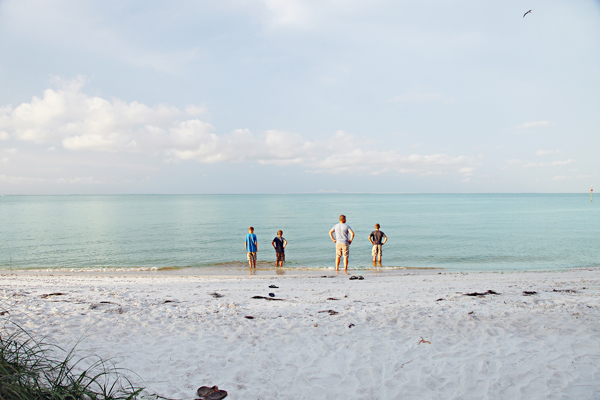 I LOVE the colors in the photo you chose and the fact is is a family photo at one of your favorite beaches makes is so special. The Lego men...in the wooden bowl! Brilliant. I love that. We also try and keep the men separate, but then also their little accessories, but something like this is actually best. This is brilliant!I do not have lego yet as my toddler is a bit too young, but this is an idea that works for toys and bits and pieces. Thanks! As always , all your wonderful ideas. I always love your updates, especially the works in progress. 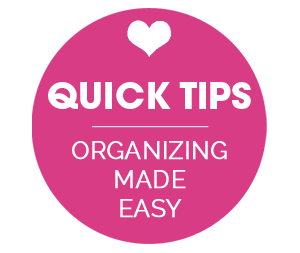 I love hearing your thought process about what and how you organize and decorate your spaces!! The link for the cabinets with doors isn't working. What's the name of that system at ikea? Absolutely LOVE this idea! Lego was already so organised but this takes it to the next level! I'm curious about the engineering print from Staples. The website says not suitable for photos...Did you ignore that? 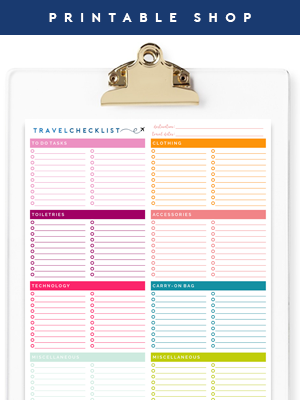 Is your print 18 x 24? thanks! When you are ready to mat and frame your photo, check out framebridge.com. 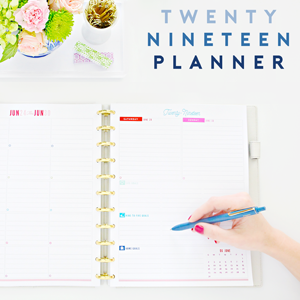 I have been impressed with their prices for larger pieces and their customer service is exceptional. 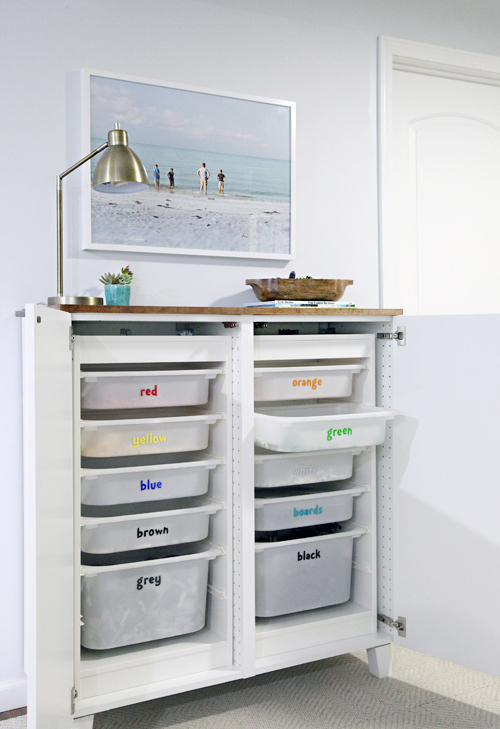 Where did you get the labels for the drawers made?